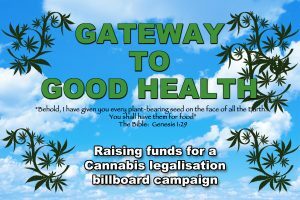 The Nimbin Hemp Embassy is organizing an ongoing billboard campaign dedicated to changing Australia outdated cannabis laws. America used billboards a lot to get their Cannabis law changes on the agenda and we thought we could give it a go too. One billboard for a year costs about $5000. There is no way Australia can introduce a proper medical Cannabis regime while we can’t drive with any THC in our system. It’s that simple. We are being held to ransom by Big Pharma who is fighting tooth and nail to keep weed illegal. It’s all about profit and money. Prohibition always was about profit. Controlling the global pain relieving market is a licence to print cash. Imagine there is a plant you can grow in your garden that takes away your pain AND makes you feel good? The problem for Big Business is that no one makes money then. Of course most people won’t grow their own, like they don’t brew their own grog, but others can grow it for them. We have been completely lied to about this plant which has never killed anyone in thousands of years of popularity. It was in a majority of medicines only a hundred years ago. Early testing of stoned drivers actually found them safer and more alert, but of course funding for such trials dried up quickly. If this is your daily medicine of course you are safer driver with it the same as the millions who take their Big Pharma pills every morning. Any donation is appreciated and please send this appeal on to your friends.